VATICAN CITY (CNS) — The secretary of the Prefecture for the Economic Affairs of the Holy See testified in a Vatican court that he felt he was being threatened and had little choice but to give confidential documents to two Italian reporters. “If that isn’t a concrete threat, (I don’t know what is),” Msgr. Vallejo Balda told the court March 15, his second day of testimony. The day before, he had admitted leaking confidential Vatican documents. In his testimony, Msgr. Vallejo Balda said he knew that Chaouqui and Nuzzi knew each other well and so he gave documents to Nuzzi in order to win his trust and stave off any threat Chaouqui posed to him. “For me, giving those documents was a way to pay for my freedom,” he said. The monsignor also told the court that Maio, his personal assistant, resigned in December 2014, six months before he passed along the documents; the assistant, he said, was unaware of the leak. The day’s court session ended with Fittipaldi being called to the stand. The Italian journalist testified that by the time Msgr. Vallejo Balda gave him the documents, he had nearly completed writing his book and that he used only two of the leaked documents: a semi-official budget of the Institute for the Works of Religion, commonly known as the Vatican bank, and a letter signed by Cardinal George Pell, prefect of the Vatican Secretariat for the Economy. On the trial’s first day of testimony, March 14, Msgr. Vallejo Balda testified he passed along several documents to both Nuzzi and Fittipaldi. He also admitted to giving Nuzzi five pages containing passwords to private emails and password-protected documents. 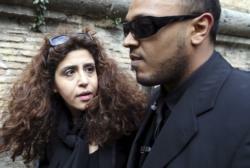 The monsignor had told the court he grew increasingly suspicious of Chaouqui, saying she told him she was “the number two in the Italian secret service” and testified that he suspected she had ties with the Mafia. During a break in the trial March 15, Fittipaldi told journalists Msgr. Vallejo Balda contradicted his own testimony the previous day that he was pressured to leak the documents.